den Oktober 6, 2016, 4:32 p.m.
Democratic Presidential nominee Hillary Clinton not only “won” last week’s first presidential debate, but according to the latest Economist/YouGov Poll, she managed to raise the enthusiasm of her supporters, erase some doubts about her health and stamina, and outscore Republican Donald Trump on a series of “presidential” qualities, including temperament, qualifications and even appearance. The debate made little impact on vote preference – Clinton led Trump by three points among registered voters before the debate in a four-way contest, and she led Trump by the same margin afterwards. 43% say they will vote for Clinton in the four-way contest this week, while 40% favor Trump. But Clinton’s supporters clearly are feeling better about her candidacy now than they were before the debate. They are now just as likely as Trump‘s voters to say they are enthusiastic about their party’s nominee. Last week, there was a 13-point gap in enthusiasm. The enthusiasm gap narrowed not only because Clinton’s voters are happier with her candidacy. The percentage of Trump voters who say they are enthusiastic about his position as the GOP nominee dropped six points after the debate. While a majority of voters (53%) continue to hold negative views of Clinton, her gap between unfavorable and favorable evaluations has narrowed in the last week from 15 points to eight. More (63%) view Trump unfavorably – and unfavorable ratings outnumber favorable ones by 29 points. 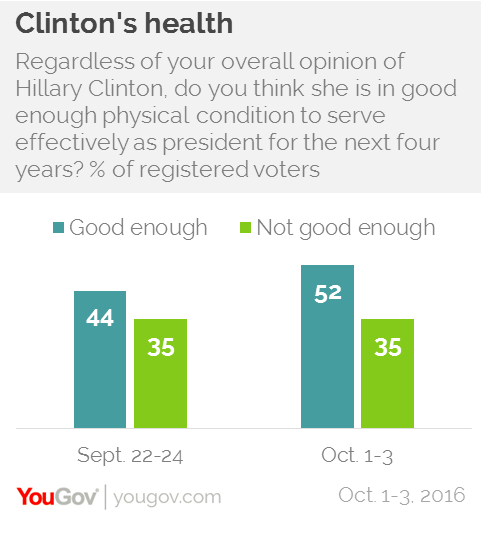 Clinton’s debate performance may have put to rest concerns about the former Secretary of State’s health – at least among some voters. Last week, following her bout with pneumonia, only 45% thought she was physically strong enough to serve effectively as president for four years. Now, 52% do. And half believe that she has the stamina to serve as President. Trump continues to score higher than Clinton on both those measures, and there has been little change in the perception of his health in the last week. Clinton holds an overwhelming advantage over Trump when it comes to presidential qualifications and presidential temperament. 54% of registered voters say she is qualified for the job; just over a third believe Trump is. 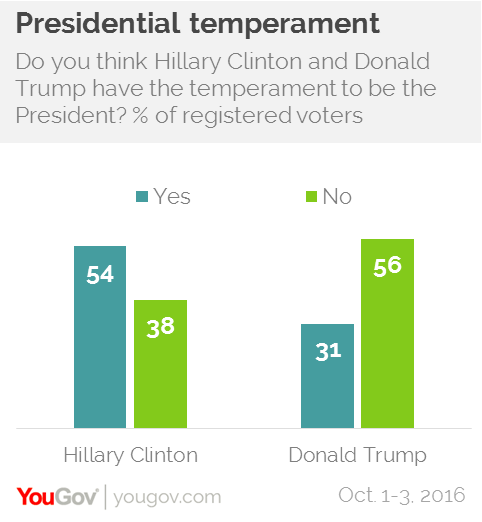 Despite Trump’s claim during the debate that “I think my strongest asset, maybe by far, is my temperament,” registered voters are 23 points more likely to say Clinton has the temperament to be president than to say that about Trump. That is even clearer when it comes to how the candidates displayed that temperament during the debate: 58% of registered debate watchers thought Clinton showed the temperament for the presidency during the debate. Just a third said Trump did. One reason could be the difference in voters’ answers to questions about how the candidates prepared for last week’s debate – just 21% believe Trump prepared enough for the debate, compared with 80% who said Clinton did. Only a little over a third of Trump’s own supporters believed he prepared enough. Another area where Clinton performs better than Trump with the public comes on questions about whether each candidate “looks presidential.” Despite Trump’s claim that Clinton doesn’t have a “presidential look,” Americans disagree. Just over half say Clinton does, half say Trump does not. But this is a question that elicits gendered answers. After all, there has never been a woman president. Men are as likely to say each contender looks presidential as to say the opposite; women view Clinton – but not Trump – as looking presidential. Of course, as in so many poll questions this year, candidate evaluations often reflect vote choice. 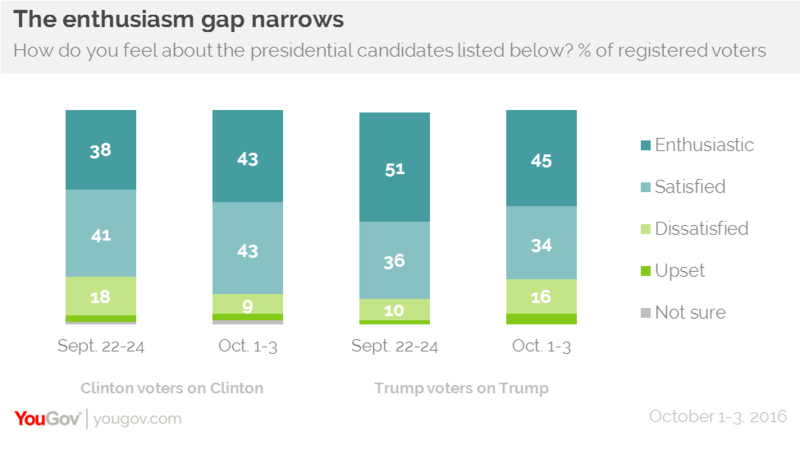 In this poll, women voters give Clinton a double-digit lead (47% to 36%) in the four-way contest; men are more closely divided, but favor Trump 44% to 39%. In this poll, Clinton outscored Trump with viewers in last week’s debate by a 34-point margin. 51% though she did the better job and 17% thought Trump did. That’s a slightly larger than the margin recorded in the YouGov poll conducted the day after the debate. 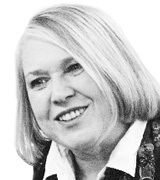 But Clinton did not assuage several policy concerns. Just about half of voters say they are uneasy about Clinton’s approach to handling the economy, terrorism and immigration. Just over half are uneasy about Trump’s approach to these issues, too. Clinton does marginally better than Trump when it comes to handling terrorism and immigration; the two are even when it comes to the economy.